Bring it back... please don't take this one away from us!!! Out of all the Ardbegs in the range, this has been my favorite so far, because of the nuances of character that I haven't quite found anywhere else. 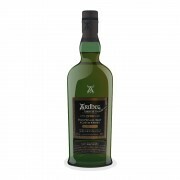 Don't get me wrong, I am a diehard Ardbeg fan and like pretty much everything in the range no matter what many critics say about popularity ruining the consistency, but this one was just something special for me. Pricey little bottle, but worth every penny. Notes of cream, ice cream, and vanilla emerge from the peat to wrap the intense phenols on the nose in a delicious soft shell. The vanilla notes emerge again on the palate, coming out a good while after the peat has coated the tongue, melts away into a smoothness that is unlike anything I've had before in an Islay malt. Truly one of a kind. I've compared this to an Ardbeg milkshake and will probably cry on the day that this bottle is empty. There was one store in Dallas that had 4 bottles of the 2008 bottling around Christmas. Having spent lots on Christmas, I was unable to buy all of them, but I did get one. As soon as I finish the one bottle I do have open, I am going to have to lock up the reserve bottle. I don't trust myself. I just LOVE Ardbeg.